Structural Morphology is the study of the relation between form and force, which can be considered the guiding theory for this challenge. The relation between form and force is important for all types of structures during the entire structural design process. Thus, Structural Morphology has a wide range of related research subjects and multiple research approaches. Therefore, Structural Morphology has gained neither a clear definition nor a unified methodology. In the present research, a theoretical framework for Structural Morphology has been proposed, that provides an effective solution to the challenge mentioned above. To enrich the proposed framework of Structural Morphology, systematic Form-Finding research on shell structures is conducted. Shell structures, the structural efficiency of which depends strongly on their 3D shape, have particular problems regarding the relationship between form and force. To obtain a structurally efficient shell, the form should follow the flow of forces, and a process of Form-Finding can achieve this. In this thesis, Form-Finding of shells indicates a process of generating the equilibrium structural forms of hanging, tent or pneumatic physical models. In Chapters 2 and 3, a theoretical framework for Structural Morphology is established. Structural systems are divided into two categories based on their responses under the loads: ‘Force-Active’ and ‘Force-Passive’. A ‘Force-Active’ structural system can significantly and actively adjust its shape due to the loads, while a ‘Force-Passive’ system cannot. A generic conceptual model of the numerical analysis process of structural systems is presented, which is suitable to both categories of structural systems. This conceptual model includes three parts: (1) the initial system described by five categories of parameters: geometry, material distribution, material properties, boundary conditions and forces; (2) the setup of equations and calculation methods to handle the above parameters; and (3) the structural performance described by two categories of parameters: the structural form and its mechanical behaviour (Chapter 2). A conceptual model of Structural Morphology is proposed by adding further requirements of the structural form or the mechanical behaviour and an optimisation process into the above conceptual model of the numerical analysis process of structural systems. Then, a corresponding conceptual formula of Structural Morphology is concluded. Thus, a theoretical framework of Structural Morphology is established. 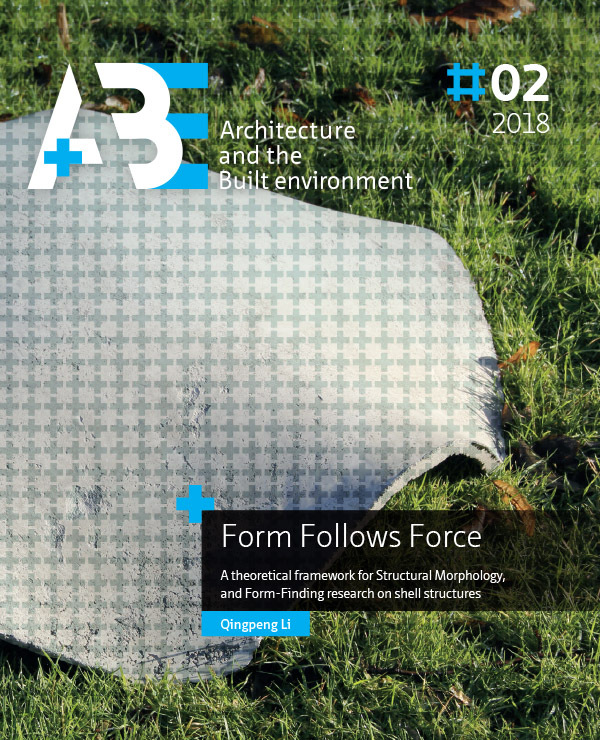 Subsequently, its feasibility is validated by a comprehensive discussion of the two main aspects of Structural Morphology, including ‘Form-Finding’ and ‘Structural Optimisation’. In this research, Form- Finding relates to Force-Active structural systems, which means the generation of multiple equilibrium shapes subject to architectural space constraints. Structural Optimisation relates to Force-Passive structural systems, which indicates the adjustment of relevant parameters of the initial structural system with the aim of improving its mechanical behaviour. The methodology of both aspects is presented. Research achievements completed by the author’s research groups from Harbin Institute of Technology (HIT) and Delft University of Technology (TU Delft) are presented to validate the feasibility. These achievements cover the research on Form-Finding of cable-nets and membrane structures, and on the Structural Optimisation of shells and gridshells (Chapter 3). In Chapters 4 to 7, the proposed theoretical framework for Structural Morphology is enriched by systemic Form-Finding research on shell structures. To study the form of shell structures, the curvature analysis of the surface is displayed. To study the mechanical behaviour of shell structures during the conceptual structural design process, an assessment strategy based on its linear static behaviour and buckling behaviour under two different load cases is proposed. To comprehensively study the linear static behaviour of a shell structure where bending moments may or may not be dominant in this shell, the membrane over the total stress ratios and strain-energy ratio are introduced (Chapter 4). The Vector Form Intrinsic Finite Element (VFIFE) method is a recently developed numerical analysis method. At the beginning of this research, few studies on the Form-Finding of shell structures using the VFIFE method were found in the literature. The VFIFE method is applied to generate equilibrium shapes of Force-Active structural systems and thus the structural geometries of shells. A MATLAB script and a plug-in in the Rhino-Grasshopper platform are developed (Chapter 5). Form-Control of Force-Active structural systems aims to generate form-found structural forms subject to the required architectural space constraints. Two Form-Control strategies are developed by combining two simple optimisation algorithms (the Newton-Raphson method and the inverse iteration method) with the VFIFE method. These strategies can help designers determine the structurally efficient forms more easily and more efficiently than some relatively complicated and time-consuming optimisation algorithms (Chapter 6). Based on the proposed theoretical framework of Structural Morphology, multiple structural forms of form-found shell structures are obtained by adjusting the five categories of parameters of the initial structural systems. This work can efficiently and effectively provide multiple structural forms with reasonable mechanical behaviour for designers from the perspective of structural engineers (Chapter 7). In Chapters 8 and 9, the specific influence of curved supports on the structural forms and the mechanical behaviour of these shells is studied. Intuitively and qualitatively, designers may be able to select the correct shapes for the supports of shells. However, there was a need to quantify the consequences of designing particular shell supports. In this work, form-found shells with slightly different support shapes are analysed numerically and experimentally. Four hexagonal form-found shells generated from hanging models with different support shapes but with the same target point are generated. The following four support shapes are considered: straight supports, outwardcurved supports, inward-curved supports and strongly inward-curved supports. From the numerical comparison, slight changes of the support shapes have a relatively small influence on the equilibrium structural forms but have a considerable influence on the mechanical behaviour of these form-found shells. It is concluded that we can improve structural efficiency by slightly curving the supports during the Form-Finding process, which would not significantly change the architect’s design scheme (Chapter 8). In the experimental research, three scaled plastic shell models (with straight supports, outward-curved supports, and inward-curved supports) are tested, and the shadow Moiré method is used in the observation of the deformation of the shells. Form these tests, the influence of the support shapes on form-found shells is studied visually by these obtained Moiré patterns, which represent the buckling modes of these shell models influenced by the curvature distribution near the supports as well as thickness distribution (Chapter 9). There are still issues that need to be solved in future research. For instance, the theoretical framework for Structural Morphology needs to be enriched with Structural Optimisation work, more complicated design constraints need to be considered in the Form-Finding process of shell structures (for example, the stress level or distribution in the shell), and more influence factors of the form-found shells need to be researched (for example, the number or length of the supports, and edge beams).